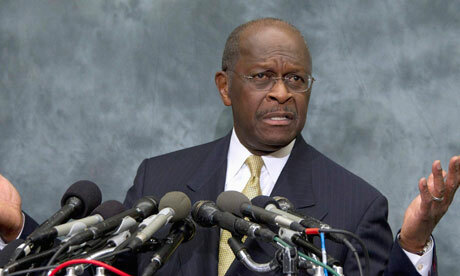 The Midnight Review: Herman Cain's "Friends With Benefits"
"Wasn't Black Walnut enough for them?" When it was first announced that there was a woman claiming Herman Cain acted inappropriately towards her and that she was paid off by the National Restaurant Association to go away, it was somewhat plausible to consider that the NRA was just covering their bases by avoiding a potentially costly legal issue from a false claim. When it was discovered that there were multiple women who were paid off the old saying of "when there's smoke there's fire" started to sound more true. When even more women stepped forward claiming Cain acted inappropriately, Cain's wife had a sudden media absence and then appeared on Fox News shortly after saying that Cain was a sweet husband that would never do such a thing and that she knew nothing of the previous accusations, things were pretty apparent - Cain was lying big time. I don't know about you but if I was accused of sexual harassment my wife would be the first person to hear - not the last. Fast forward a couple weeks and some slipping poll numbers and now there is a woman has come forward with more than a non-disclosure agreement or a statement from her then boyfriend backing up her story - she has an autographed "friends with benefits" book, records showing dozens of phone calls and text messages, and stories that can most likely be corroborated with a little research such as comparing receipts, plane tickets, and phone calls to Cain's known whereabouts at that time. Before the story even broke Cain addressed the media acknowledging yet another woman would step forward alleging a long time affair and that while he knew this woman, they were nothing more than friends and anything else was a lie. This might be believable if it weren't for all of the other women who have stated otherwise. What is even more alarming is that this relationship lasted until recently. Over the Thanksgiving weekend, FOX 5 senior I-Team reporter Dale Russell sat down with Ginger White, who had a story to tell. White was worried a political tsunami was headed her way. So, she decided to head it off, by confessing she was involved in a 13-year-long affair with presidential hopeful Herman Cain. Ginger White says she met Herman Cain in the late 90s in Louisville, Kentucky, when as president of the National Restaurant Association, he made a presentation. She was impressed. She says they shared drinks afterwards and he invited her back to his hotel room. She says in his hotel room, he pulled out a calendar and invited her to meet him in Palm Springs. She accepted, and she says the affair began. She says he gave her his newly-published book, Leadership is Common Sense, and he wrote: “Miss G, you have already made a 'big difference!’ Stay focused as you pursue your next destination." She says during the next 13 years, he would fly her to cities where he was speaking and he lavished her with gifts. She says they often stayed at the Ritz Carlton in Buckhead and dined at The Four Seasons restaurant. She says he never harassed her, never treated her poorly, and was the same man you see on the campaign trail. When his new book, CEO of SELF, came out in 2001, she says Cain once again autographed it for her writing, "'Friends are forever! Everything else is a bonus.'" White had said that she had come forward because of the way the other women were being treated by both Cain and the media. What is possibly even more interesting is the response from Cain's attorney, Lin Wood: "No individual, whether a private citizen, a candidate for public office or a public official, should be questioned about his or her private sexual life." Not only is his attorney not denying a sexual relationship with Ginger White, his lawyer is essentially lumping the sexual harassment claims as being the same as a consensual relationship and should therefor not be questioned, which makes it appear all more damning for Cain. This most recent accusation when considering Cain's bizarre defense of the other allegations - earlier in the month Cain told reporters there could possible be more. While other Republicans are calling for Cain to drop out - probably because of the negative press he is bringing to not only him but to the entire field, as well as the lack of coverage to the other field - Cain has decided to stick around, or at least as long as his wife wants him to stick around. Considering his wife has allowed him to run past the first couple waves of sexual misconduct, Cain will probably be in it a little longer. Update - Looks as if the Black Walnut may have realized his web of lies have gotten too complex to handle. According to sources, Cain is now "reassessing" his campaign due to this latest allegation. Republican presidential candidate Herman Cain told his staff Tuesday morning that he is reassessing his candidacy and will make the decision whether to remain in the race in "the next several days." Cain's campaign has been plagued by sexual harassment allegations, and Monday a woman came forward alleging a 13-year affair with the candidate. "If a decision is made, different than we should plow ahead, you all will be the first to know,” he said. "Now with this latest one we have to do an assessment as to whether or not this is going to create too much of a cloud in some peoples' minds as to whether or not they should support us going forward." He went on to deny the woman's story as he did Monday when it broke. Cain's Iowa campaign chairman, Steve Grubbs, told the AP that the allegations have hurt Cain's fundraising and taken a toll on his family. Still, Cain will continue his campaign for now and deliver a foreign policy speech in Michigan on Tuesday. What is interesting is that Cain's Iowan campaign chairman, Steve Grubbs, told the AP that these allegations have hurt Cain's fundraising but if you recall after the first allegations were made Cain's chief of staff touted his fundraising, stating that they had an extremely good day right after the Politico report raking in around $250,000 in one day, and that his campaign had raised $9.4 million in 41 days. Does this sound like the foundations for a pullout from the race? Will Cain later blame lackluster fundraising and distraction from the greater message - his 9-9-9 plan? Did Mrs. Cain finally have enough with her husband's dalliances?